Niamh is a Solicitor in the Employment Law team at Hayes Solicitors. Niamh advises both employees and employers, relating to both contentious and non-contentious employment and industrial relations matters, including recruitment, employment contracts and workplace policies, redundancies and dismissals. 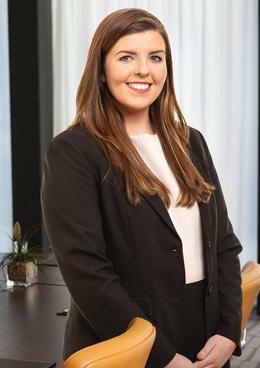 Niamh also has experience in corporate and corporate governance matters assisting clients with all aspects of the corporate life cycle, from incorporating a company in Ireland, to selling a business. Statutory compliance and policy, including in relation to maternity leave, remuneration, notice periods, working time, whistleblowing, equality, redundancy, fixed term and part time employees and agency workers. Disciplinary processes, internal investigations, hearings, appeals and dismissals. Alleged misconduct, incapacity, long term absence, performance, competence, disciplinary processes, suspensions, grievances, internal investigations, hearings, appeals and termination of employment. Mergers and Acquisitions – Co-ordinating the due diligence process and drafting transactional and ancillary documents. Advice in respect of the Companies Act 2014 – Advising clients on compliance and governance matters, including AGMs, duties of directors, the composition of the board and the role of the Chairperson.